Wayne County Soil and Water Conservation District will be holding a free ‘Soil Health’ workshop on December 13, 2016 at the Cornell Cooperative Extension offices in Newark, NY. 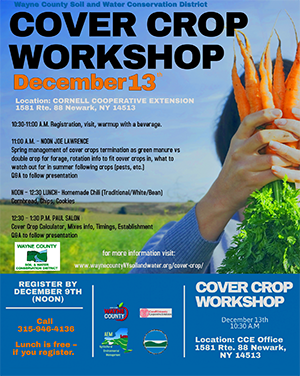 This workshop will provide information to farmers that will allow them to better understand how to incorporate cover crops successfully into their agricultural systems, and why cover crops can be so beneficial to soil health and natural resource conservation. Farmers know that good soil health is increasingly important. Soil erosion and sedimentation are one of the major problems farmers face. It takes 500 years to replenish just one inch of topsoil. The use of cover crops can help farmers by reducing the loss of a precious percentage of soil each year. Besides protection from wind and water erosion, some of the other benefits of cover crops, include the fact that they can reduce the impact of insects and soil disease pressure. Cover crops may lessen the presence of weeds, and can often build soil organic matter which help reduce soil compaction. In addition to helping to conserve soil, live cover crops allow for energy for soil microbes to recycle and store nutrients and build soil carbon and organic matter, saving fertilizer costs by scavenging nutrients or adding nitrogen to the soil through fixation. Cover crops protect water quality by reducing phosphorus runoff. Warm-up with a beverage starting at 10:30 A.M. Morning (11am-12pm) and afternoon (12:30-1:30) speakers include Joe Lawrence, Cornell University. Joe will discuss spring management of cover crops, termination as green manure vs double crop for forage, rotation and what to watch out for in summer following crops (pests, etc.). Paul Salon of the NRCS will talk about crop establishment, use of the cover crop calculator, mixes info and the timing of crops. Each segment will include a discussion and Q&A. Local farmers are encouraged to attend to share success stories on planting cover crops, how to get started using them, and the results they see on their farms. Following the morning session there will be a free lunch of homemade chili, (Traditional/White/Bean) cornbread, chips & cookies. Workshop partners include NY Wayne County, Cornell Cooperative Extension, NYS DEC, Agricultural Environmental Management (AEM).